We’re just a few weeks into a brand new year, and we’re celebrating in the Nexus with our Lunar Festival event! Li Li’s brought along her special dragon kite for the occasion, Chen has a festive new barrel of brew at the ready, and the fearsome and elegant Lunar Tiger is roaring for battle. Now you too can take part in the revelry with a new Mount, Hero Skins, and Bundle Packs! 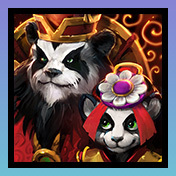 What’s more, players who log in and play 10 games of Heroes of the Storm between January 27 and the morning of March 3, 2015 will receive a special new Lunar Festival portrait! Matches played in any mode except for Custom Games will count towards unlocking this epic portrait, so make sure to jump into the Nexus for a brawl before the event comes to an end. The following Lunar Festival Items are Available Now in the Heroes Shop! * The Lunar Tiger Mount is currently available only with purchase of the Lunar Festival Complete or Lunar Festival Skin Bundles. It will eventually become available for purchase as an individual item with a future game update. Join in our Lunar Festival celebration with two brand new Bundle Packs! Check out the limited-time Bundles listed below, and be sure to pick them up before they’re removed from the Shop at a later date. We hope you enjoy this year’s Lunar Festival, and make sure to let us know what you think of all the new content in the comments below!